There is no sidewalk at 120th Avenue Northeast near Northeast 12th Street, where a large apartment building is being built. The vehicle was backing up as the pedestrian walked along the road. A street sweeper Monday morning backed over and killed a pedestrian who was walking on the side of a road because of construction, Bellevue police said. There is no sidewalk along 120th Avenue Northeast near Northeast 12th Street where a large apartment building, taking up a city block, is being built by Rafn Co., according to Officer Seth Tyler. The building’s address is 1375 121st Ave. N.E. As the street-sweeper driver was backing up, he apparently didn’t see the pedestrian, Tyler said. The driver was still being interviewed Monday, but police did not suspect impairment, he said. 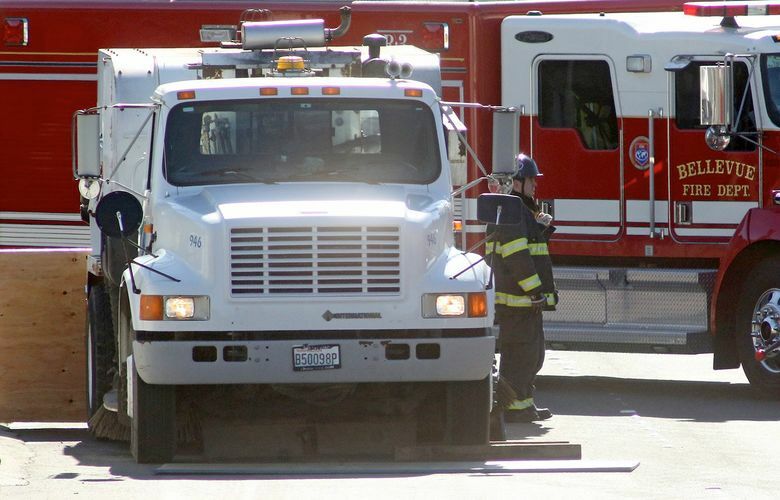 Police and firefighters, who got to the scene about 11 a.m., were still working in the early afternoon to remove the body from under the street sweeper. Northeast 120th Avenue in the area was closed. Representatives of the street-sweeping company and the contractor were on the scene. Enviro Clean was not commenting to the news media Monday afternoon. Bunn said Rafn had never had an accident like this on its projects. “We are absolutely devastated,” she said. The Bellevue-based company, which works on residential and commercial buildings, will conduct its own investigation through a safety consultant, Bunn said. Police planned to use a digital tool that creates a 3D image of the area as they try to reconstruct what happened.